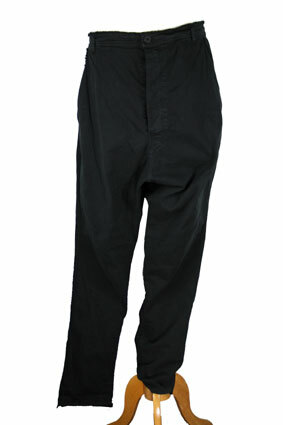 Pal Offner stretch fabric, low crotch trousers in black, style 14. 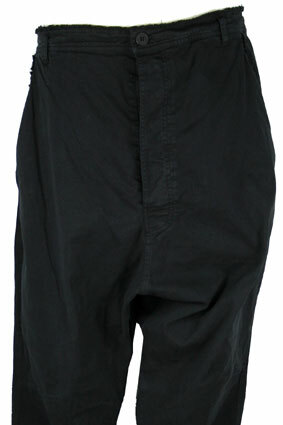 Waistband with raw edge finish. Long buttoned fly with placket. 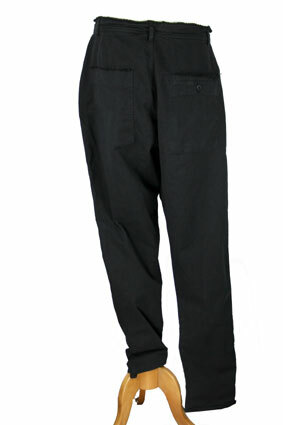 2 side pockets with raw edge trim. 2 rear pockets, left one is a patch pocket with doubled layer raw edged trim and the right pocket is not a patch pocket and also has double layer, raw edged trim and button fastening. Wider leg than style 13. Tapering leg and the leg hems are higher at the front. sizes are: 3 - 33inch M, 4 - 36 inch L, 5 - 38inch XL.